With both Pop and Leonard reportedly in New York, expect their meeting(s) to begin soon. Things are heating up fast on the Kawhi Leonard news front, which likely means it’s about to get real. We already know he and Gregg Popovich are expected to meet soon to try and hash things out. Pop has been seen meandering around New York City over the last week, and if one tweet is to be believed Leonard has recently arrived there himself (wearing those Spurs shorts again). Also, Jeff Garcia of Spurs Zone is reporting that Tim Duncan is also headed to New York. There’s no telling whether he’s going on his accord or to help pitch life as the quiet face of the Spurs to Leonard, but if he is in fact headed to the same city that Pop and Leonard are current located at (and surely Duncan knows it even if he doesn’t have a secret social media account that we are unaware of), it’s quite the coincidence otherwise. Then, there is this ESPN piece from Adrian Wojnarowski that, like always, has articles now pumping out everywhere. It begins with details of how Leonard seemed right at home among his peers at a memorial dinner for Erin Popovich in San Antonio a month back. It was like nothing was ever wrong. Throughout the gathering, Leonard appeared as comfortable as he ever does in social settings. No more, no less engaged. For a night anyway, Leonard moved easily among his contemporaries and predecessors. Months of mistrust and acrimony peeled back. Kawhi Leonard was a Spur. ”It was like he had never been away,” one Spurs alumnus in attendance told ESPN. The article also details (again) how the relationship between the two sides supposedly deteriorated over the course of the season, how they plan to resolve things in their upcoming meeting, and how the Spurs plan on approaching Leonard’s expected demand for a super-max contract worth up to $219 million. Sooner than later, there will be a meeting set with Gregg Popovich and Leonard. It’s still in the planning stages. They have been in contact, but there will be a conversation — or, perhaps, a series of them — about whether a lasting trust and partnership can be rebuilt. They’ll have to talk about medical care and treatment. They’ll have to talk about Leonard’s relationship with the coaching staff and his teammates, which is strained. They’ll have to talk about the franchise’s willingness to deliver the five-year, $219 million contract extension Leonard is eligible to receive, because the Spurs will need to be convinced that a historic contract is met with historic commitment. If Leonard wants the Spurs to make that super-maximum contract offer — and indications are indeed, yes, Leonard and his group want that offer — the history of how Popovich and Spurs president RC Buford do business suggests the offer won’t come without significant repairing of the relationship. History suggests the Spurs could want to see Leonard return to the active lineup before making a super-max offer next year, see him reinvested fully into the program. To think Popovich will walk into a room after months of discontent and immediately drop that $219 million on Leonard goes against every way the Spurs have operated. To broker a future with Leonard, it won’t be with his agent, or his uncle. It’ll be Popovich and Leonard — or it probably won’t happen. 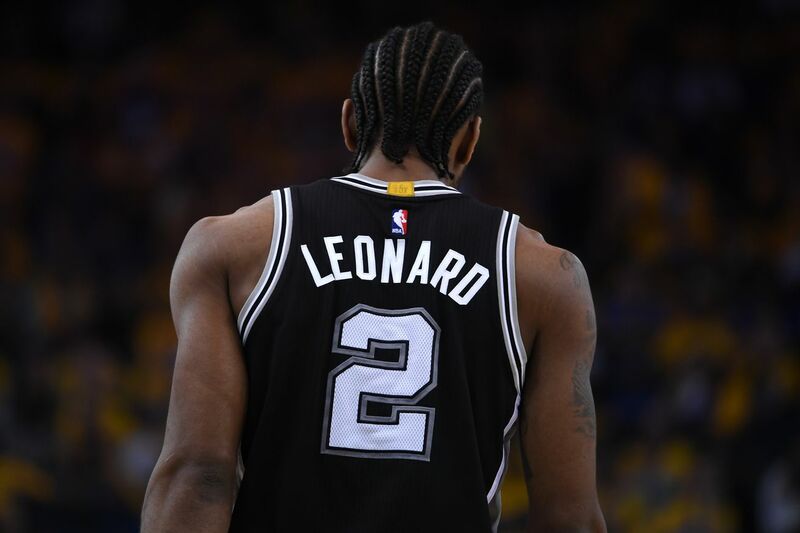 Finally, we have news from a more local source, Jabari Young of the San Antonio Express News, who reveals that Leonard is close to being 100 percent healthy — currently at about 95 percent — and expects to be available for training camp in September. Confirmation of Leonard’s long-term health will be another requirement if he expects to receive a max offer from the Spurs (or anyone for that matter). It’s a lot to absorb, but it’s looking more and more like that Pop-Leonard meeting (or series of them) is set to begin as soon as this week. There’s no telling how much information about it will actually come out, but as always we’ll keep you as informed as possible.